Whisk together both the flours, yeast, sugar and salt. Set aside. Heat milk till it is slightly warm and pour into the mixture along with the oil. Knead the dough until smooth and shiny. Cover and let rise in a warm place for 1 hour or until doubled in bulk. Punch down the dough and knead gently on a lightly floured surface. Divide dough into equal sized balls. Place each bun into a greased baking dish. 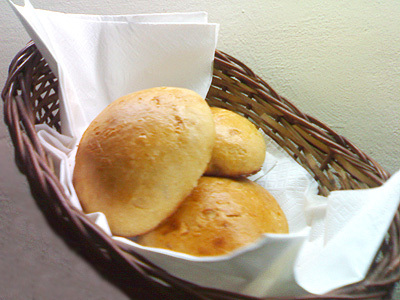 Cover with a clean cloth and let the buns rise again in a warm place until nearly double in size, approximately 1 hour. Beat together the egg yolk and water. Egg wash the buns. Bake in a preheated oven at 190° C for 20 minutes. Buns r very tempting cornstarch, nice one. plz make ur pics small at the home page, only those 2 r so big looking bad…plz do it soon.